Part of four exclusive units at Abbey Road, HARRISON'S HIDEAWAY is a free standing historic cottage on Center Street in a gated compound with 3 other units. It features a king memory foam bed and a full kitchen, which includes a 2 burner glass top stove, under counter refrigerator/freezer, microwave, and dishwasher. Also included is foil, wrap, Ziploc bags, dishwashing soap, and for your convenience coffee, sugar, and creamer. There is also another ice-maker on-site above the shared W/D for fresh ice to fill your cooler for a trip to the beach. The kitchen is equipped with everything your gourmet heart could desire to prepare your fresh catch of the day or simply heat leftovers from our fabulous restaurants (at least 22 within a several block radius). The large inside dining table is custom-made from a Sapodilla tree that once stood on the site of McCartney’s Manor. Also included for your enjoyment: a Bose Bluetooth Speaker, 50” Smart flat-screen TV, DVD player, and Amazon Alexa. There is also a full size custom sofa that sleeps an additional 2 people. The unit sleeps a total of 4 persons. The bathroom features a large marble tiled glass enclosed shower with dual shower heads and offers all the comforts of home, including a hairdryer. Of course, Tommy Bahama soap, shampoo, conditioner, and body lotion as well as pool towels are provided as an amenity. It also includes a top-of-the-line Solana 2-person private hot tub with back and foot massagers in your own private gated courtyard with table and chairs to delight your senses after a busy day of exploring our wonderful little town. The common area has a bike rack, Weber gas BBQ grill, and a washer/dryer for your use. On the shared upper deck overlooking lushly landscaped Abbey Road, you can enjoy yourselves at the common area outdoor table and chairs for up to 6 persons. Invite guests from Lennon’s Lodge, Starr’s Suite, or McCartney’s Manor to join you for drinks and conversation under the towering Spanish Lime trees. Or go up there star gaze on a warm tropical evening. Take your computer there to do some work, if you must, with our free Wi-Fi. Next door is one of our 2 heated pools for working on that perfect Key West tan! Reserve this popular cottage today! Book online 24/7. Parking in Key West is very limited. This property has no assigned parking and is street parking only. However, we do save you a parking spot for your arrival. Parking: No dedicated parking space; on-street parking only. We will save a parking spot for you upon your arrival. Pets: Pets welcome with fee; some restrictions may apply. Location: Half-block from Duval Street and Truman Ave. 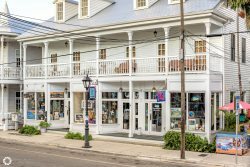 In the heart of Old Town Key West. his property exceeded our expectations. Perfect location in center of town so it made for easy walking in either direction but very peaceful and quiet. CVS around the corner and close to restaurants. Super clean and Im very particular. We loved the daily room service of clean towels and a made bed. After being out and about all day relaxing in the hot tub was great. We would definitely rent again. The bathroom is a little small but it worked for us. Truly a great rental property. One block off of Duval, very clean, completely updated and super quiet. Nice secluded patio with a hot tub. CVS pharmacy across the road, so convenient. Highly recommend Harrison's Hideaway!